The Kindle app on iOS has just had an update to version 4.1, which brings with it several new features. For students, there are flashcards and in-book search; for readers, there are notebook filters, how much of the book is left, and more. Amazon has also made the app more stable and improved performance. Using X-Ray, students can now convert important terms from textbooks and notes into flashcards, improving their recall of the subject. The X-Ray feature itself has got an update too, allowing readers to sort characters and terms by relevance, alphabetically, or in order of appearance in the book. It seems that Amazon has also bettered its OCR The 3 Best Free OCR Tools to Convert Your Files Back Into Editable Documents The 3 Best Free OCR Tools to Convert Your Files Back Into Editable Documents Optical Character Recognition (OCR) software turns printed documents into machine-readable text. Here we show you the best free OCR tools and how they work. Read More (Optical Character Recognition) capabilities as search in print replica textbooks is faster and more powerful, complete with instant auto-complete suggestions as you type. Notebook filters let readers refine bookmarks, notes and highlights, with the ability to directly navigate to the annotated passage. Such annotation tools might be all that’s needed to decide the winner in the war of Kindle vs. iBooks iBooks Vs. Kindle - Which Is Better? [iPad] iBooks Vs. Kindle - Which Is Better? [iPad] A while ago I wrote a post about places to find free books for the iPad. 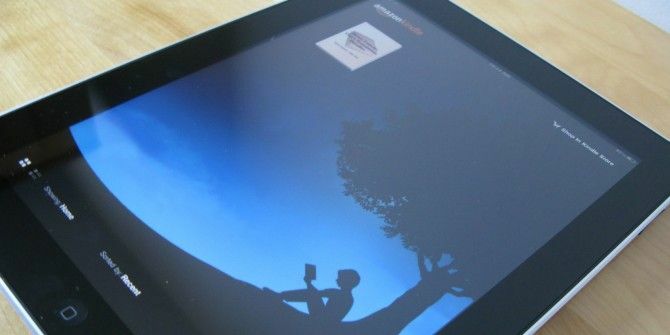 In that post, I compared the iPad to designated eReaders and expressed the opinion that it’s not a worthy... Read More . Meanwhile, page footers show you how much of a book you have left and how much is left to read, by showing the page number or time left in a book. You can also switch this off for a blank page footer. Other improvements to Kindle for iOS 4.1 include a redesign of the dictionary and multi-edit capability in the library view. You can download the new Kindle from the iTunes App Store. And once you get it, Bakari has a great guide on setting up Kindle on your iOS device Setting Up Kindle On Your iPad & Other iOS Devices Setting Up Kindle On Your iPad & Other iOS Devices The iPad makes for an awesome paperless device, for reading eBooks, webpage articles, PDF documents and the like. Likewise, the Amazon Kindle Store offers probably the widest, relatively affordable selection of eBooks for iOS devices.... Read More .